Laugh4Hope is an annual family-friendly comedy night that brings hope to the community through laughter. Super funny and squeaky clean, come to the 6th annual Laugh4Hope stand-up comedy night! 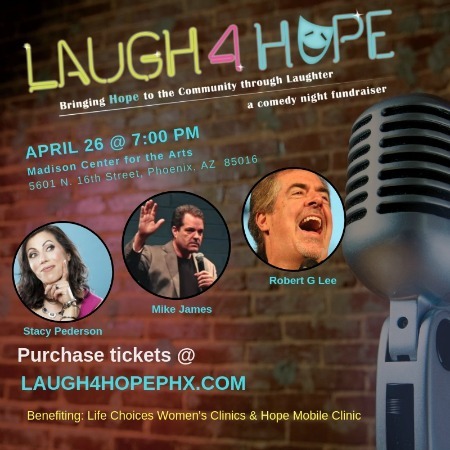 Laugh4Hope will promise you a night of good, clean laughter. The humor is aimed at adults and older children/teenagers. It'll keep you laughing for days! Designed to both uplift and encourage community in the Valley, proceeds benefit local, non-profit, low-cost healthcare centers that serve women and children in need across the Greater Phoenix area, Life Choices Women's Clinics and on the HOPE Mobile. Our reason is simple, to provide a night of clean comedy that unites people and serves a greater purpose all while laughing at the humorous irregularities of life! In these hectic times, get back to basics with your family and loved ones, reconnect with your co-workers and friends by laughing together for a fun, memorable night! Doors open at 6 pm, show starts promptly at 7 pm. Lobby doors will open one hour prior to show time. Show runs approx. 2 hours 20 minutes.